This past week I got the idea that I might try making my own design for a dragon plushie and even go a step further and make it. I asked my friends if any of them would like the prototype of my dragon. One of my apartment mates took me up on the offer. I became excited, and started to make the dragon in two of her favorite colors, red and black. When the plushie was finally done, I’ll have to admit that I did not like it. At all. While working on it, a friend noticed it and said it looked like “Super Devil” from Family Guy. After that, I could not stop imagining my little creation as a demon. 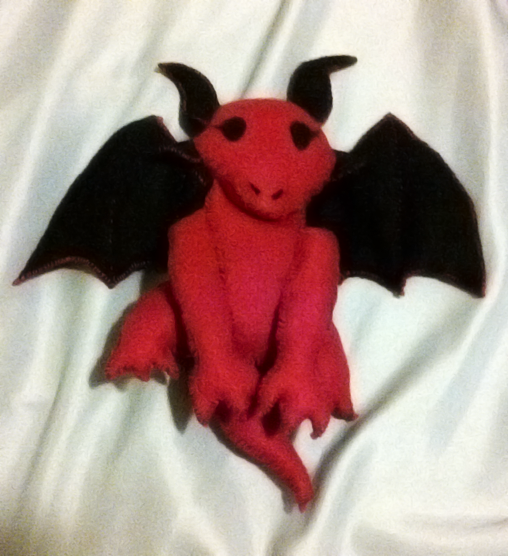 I started to dislike the fact that my plushie looked dark and demonic-like. I really wanted this design to show off my style, and this was not it. I finally gave it to my apartment mate over the weekend, and she squealed! Which turned to a crazy laughter then back to squealing. So all things considered, I’m very thankful that she enjoys the plushie. At least someone will be happy with my little creation. As for the plushie design, I think I’m going to have to tweak it a bit.